KVA partners with ACTS during the school year to serve our community. This week, students are asked to bring in canned goods or non-perishable food that will be donated to this important organization. The food drive is January 28 - February 1. 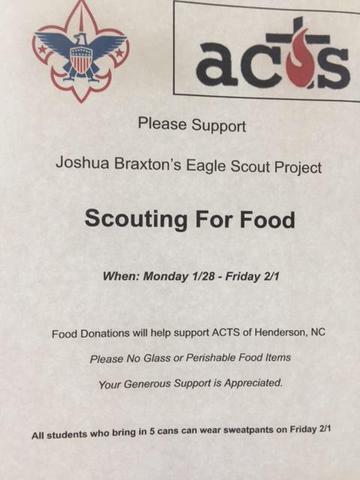 Joshua Braxton, a KVA senior, is spearheading the effort for our school as part of his Eagle Scout Project. Thank you for supporting our food drive and Josh!